On February 7th Gordon Graham passed away peacefully in Cochrane, Alberta. His devoted wife Pat and members of his family were with him as he moved on. 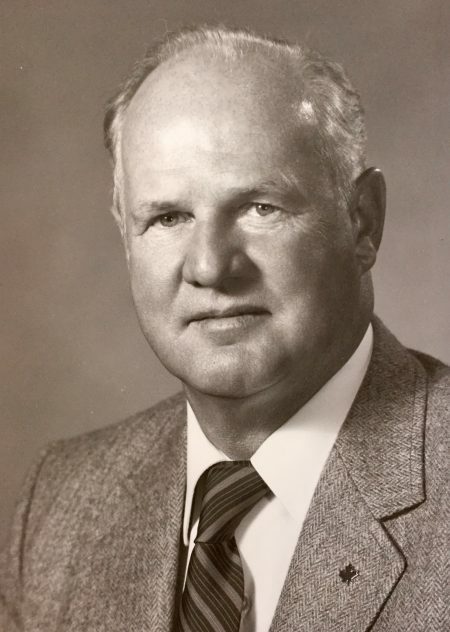 A farmer from Newdale, Manitoba, Gordon was a leader in the agricultural community. A graduate of the University of Manitoba’s Agriculture Diploma program, he met Patricia Fall, the love his life, while attending university. Gordon was constantly looking for ways to add value to agricultural production leading him to become a seed grower and run a successful seed plant in addition to farming. 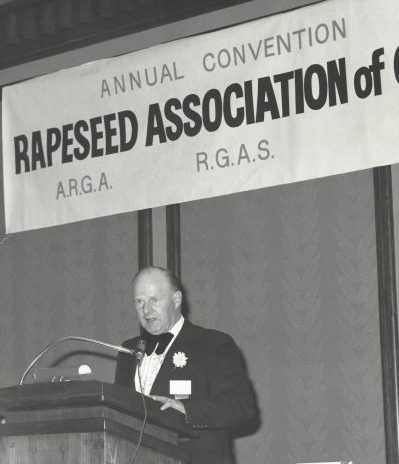 He vigorously supported the introduction of rapeseed and its transformation into modern canola as a free enterprise option for farmers looking to diversify their marketing options. Always an advocate for producers, he was the first farmer to become Chairman of the Canola Council of Canada in 1975 through 1977. Gordon’s unswerving support for the canola industry was recognized with a lifetime membership to the Canola Council of Canada in 1998 and the Queen Elizabeth II Diamond Jubilee Medal in 2012. After Gordon and Patricia retired and sold their farm they started on a new adventure. In their full sized RV they toured all over North America, wintered in Florida and built a new house in Cochrane. It is truly said that Gordon was never happier when he was on the road heading for a new destination. Gordon had a quick sense of humour and a willingness to tease and be teased. He will be remembered for his devotion to family and his love of dogs, especially his favourite four-legged companion Kelly. Gordon will be sorely missed by Patricia and the extended family, son Perry Graham, daughter-in-law Louise Lefebvre, daughter Nancy, her husband Don Marks, and five grandchildren Morgan, Tom, Trish, Derek and Emma. We all wish him open roads and a clear sky as he heads for his latest destination. A special thank you is extended from the family to the caring and compassionate staff at Bethany Cochrane for their care of Gordon during his illness. Donations may be made to the Cochrane Warm Water Therapy Pool Society. A memorial service is planned in Brandon, Manitoba in June. Condolences, thoughts and prayers to Pat and Families on news of Gordon’s passing. So very fortunate and pleased to have know you as neighbours in your retirement years. P.S. Merlyn also sends her sympathy and condolences. Pat and family my very sincere condolences on Gordon’s passing. I feel very fortunate to have gotten to know him over the years and to spend some time with him. He always shared wonderful stories of days gone by and of his family and grand children. He was very passionate of those things that interested him and always very knowledgeable. God speed to him and may all your wonderful memories give you comfort Pat. Big hugs to you all. Please accept my most heartfelt condolences, just know that I am here for you. Please don’t hesitate to reach out, especially during this difficult time. Pat, I send my sincere condolences to you and family on the news of Gordon’s passing. I always felt a common bond in that we were both farm people from Manitoba. We all moved onto the same street in Cochrane that summer of 1997 and shared community spirit and grilled burgers while replacing all that sod. Barb & I look forward to seeing you again Saturday mornings around town.